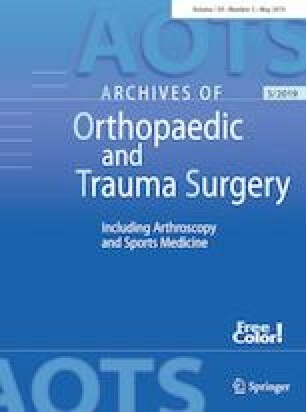 Malpositioning of the cup in total hip arthroplasty (THA) is associated with dislocation, early polyethylene wear, and impingement. The direct anterior approach (DAA) THA allows for intraoperative fluoroscopy imaging (IF). The current study investigates the following research hypotheses: (1) intraoperative measurements of radiographic cup inclination (RI) are reliable and reproducible. (2) A correction factor can compensate for the complex parallax effects when using IF. In 2016, 100 consecutive hips underwent primary THA utilizing DAA and IF for cup placement. RI was measured on intraoperative fluoroscopy images and postoperative AP pelvis radiographs. Determination of RI on IF images is reliable and reproducible (ICC 0.851–0.950). RI measurement on IF images had a good correlation with the corresponding postoperative RI on AP pelvis radiographs (r = 0.538, p < 0.001). However, intraoperative RI measurements are on average 4.9° lower compared to postoperative measurements (SD 2.5°). Intraoperative fluoroscopy is a reliable tool to measure RI during DAA THA. The surgeon needs to apply a 5°. correction factor to the intraoperative measurements to adjust for parallax.